The epidermis is the outermost of the three layers that make up the skin, the inner layers being the dermis and hypodermis. The epidermis layer provides a barrier to infection from environmental pathogens and regulates the amount of water released from the body into the atmosphere through transepidermal water loss. The epidermis is composed of multiple layers of flattened cells that overlie a base layer (stratum basale) composed of columnar cells arranged perpendicularly. Microscopic image showing the layers of the epidermis. 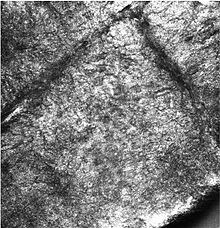 The stratum corneum appears more compact in this image than above because of different sample preparation. The rows of cells develop from stem cells in the basal layer. Cellular mechanisms for regulating water and sodium levels (ENaCs) are found in all layers of the epidermis. The word epidermis is derived through Latin from Ancient Greek epidermis, itself from Ancient Greek epi, meaning 'over, upon' and from Ancient Greek dermis, meaning 'skin'. 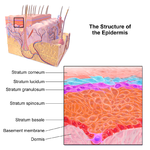 Something related to or part of the epidermis is termed epidermal. The epidermis primarily consists of keratinocytes (proliferating basal and differentiated suprabasal), which comprise 90% of its cells, but also contains melanocytes, Langerhans cells, Merkel cells, and inflammatory cells. Epidermal thickenings called Rete ridges (or rete pegs) extend downward between dermal papillae.Blood capillaries are found beneath the epidermis, and are linked to an arteriole and a venule. The epidermis itself has no blood supply and is nourished almost exclusively by diffused oxygen from the surrounding air. Epidermal cells are tightly interconnected to serve as a tight barrier against the exterior environment. The junctions between the epidermal cells are of the adherens junction type, formed by transmembrane proteins called cadherins. Inside the cell, the cadherins are linked to actin filaments. In immunofluorescence microscopy, the actin filament network appears as a thick border surrounding the cells, although the actin filaments are actually located inside the cell and run parallel to the cell membrane. Because of the proximity of the neighboring cells and tightness of the junctions, the actin immunofluorescence appears as a border between cells. 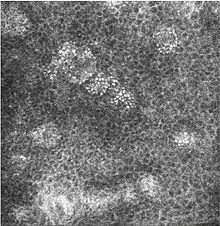 Composed of 10 to 30 layers of polyhedral, anucleated corneocytes (final step of keratinocyte differentiation), with the palms and soles having the most layers. Corneocytes contain a protein envelope (cornified envelope proteins) underneath the plasma membrane, are filled with water-retaining keratin proteins, attached together through corneodesmosomes and surrounded in the extracellular space by stacked layers of lipids. Most of the barrier functions of the epidermis localize to this layer. This narrow layer is found only on the palms and soles. The epidermis of these two areas is known as "thick skin" because with this extra layer, the skin has 5 epidermal layers instead of 4. The Malpighian layer (stratum malpighi) is both the stratum basale and stratum spinosum. 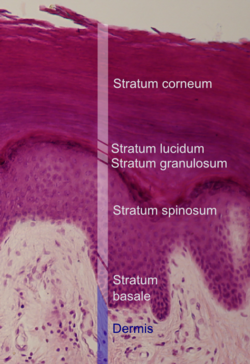 As a stratified squamous epithelium, the epidermis is maintained by cell division within the stratum basale. Differentiating cells delaminate from the basement membrane and are displaced outward through the epidermal layers, undergoing multiple stages of differentiation until, in the stratum corneum, losing their nucleus and fusing to squamous sheets, which are eventually shed from the surface (desquamation). Differentiated keratinocytes secrete keratin proteins, which contribute to the formation of an extracellular matrix that is an integral part of the skin barrier function. In normal skin, the rate of keratinocyte production equals the rate of loss, taking about two weeks for a cell to journey from the stratum basale to the top of the stratum granulosum, and an additional four weeks to cross the stratum corneum. The entire epidermis is replaced by new cell growth over a period of about 48 days. This inner layer is a germinal epithelium that gives rise to all epidermal cells. It divides to form the outer spinous layer (stratum spinosum). The cells of these two layers, together called the Malpighian layer(s) after Marcello Malpighi, divide to form the superficial granular layer (Stratum granulosum) of the epidermis. The epidermis serves as a barrier to protect the body against microbial pathogens, oxidant stress (UV light), and chemical compounds, and provides mechanical resistance to minor injury. Most of this barrier role is played by the stratum corneum. Physical barrier: Epidermal keratinocytes are tightly linked by cell–cell junctions associated to cytoskeletal proteins, giving the epidermis its mechanical strength. Chemical barrier: Highly organized lipids, acids, hydrolytic enzymes, and antimicrobial peptides inhibit passage of external chemicals and pathogens into the body. Immunologically active barrier: The humoral and cellular constituents of the immune system found in the epidermis actively combat infection. An acidic pH (around 5.0) and low amounts of water make the epidermis hostile to many microorganic pathogens. Non-pathogenic microorganisms on the surface of the epidermis help defend against pathogens by competing for food, limiting its availability, and producing chemical secretions that inhibit the growth of pathogenic microbiota. The amount and distribution of melanin pigment in the epidermis is the main reason for variation in skin color in Homo sapiens. Melanin is found in the small melanosomes, particles formed in melanocytes from where they are transferred to the surrounding keratinocytes. The size, number, and arrangement of the melanosomes vary between racial groups, but while the number of melanocytes can vary between different body regions, their numbers remain the same in individual body regions in all human beings. In white and Asian skin the melanosomes are packed in "aggregates", but in black skin they are larger and distributed more evenly. The number of melanosomes in the keratinocytes increases with UV radiation exposure, while their distribution remain largely unaffected. ^ Young, Barbara (2014). Wheater's functional histology a text and colour atlas. Elsevier. pp. 160 & 175. ISBN 9780702047473. ^ a b c Marks, James G; Miller, Jeffery (2006). Lookingbill and Marks' Principles of Dermatology (4th ed.). Elsevier. pp. 1–7. ISBN 978-1-4160-3185-7. ^ a b c d e f Proksch, E.; Brandner, J.; Jensen, J.M. (2008). "The skin: an indispensable barrier". Experimental Dermatology. 17 (12): 1063–1072. doi:10.1111/j.1600-0625.2008.00786.x. PMID 19043850. ^ a b c d McGrath, J.A. ; Eady, R.A.; Pope, F.M. (2004). Rook's Textbook of Dermatology (7th ed.). Blackwell Publishing. pp. 3.1–3.6. ISBN 978-0-632-06429-8. ^ a b c Hanukoglu I, Boggula VR, Vaknine H, Sharma S, Kleyman T, Hanukoglu A (January 2017). "Expression of epithelial sodium channel (ENaC) and CFTR in the human epidermis and epidermal appendages". Histochemistry and Cell Biology. 147 (6): 733–748. doi:10.1007/s00418-016-1535-3. PMID 28130590. ^ James, William; Berger, Timothy; Elston, Dirk (2005) Andrews' Diseases of the Skin: Clinical Dermatology (10th ed.). Saunders. pp. 2–3. ISBN 0-7216-2921-0. ^ Stücker, M; Struk, A; Altmeyer, P; Herde, M; Baumgärtl, H; Lübbers, DW (2002). "The cutaneous uptake of atmospheric oxygen contributes significantly to the oxygen supply of human dermis and epidermis". The Journal of Physiology. 538 (3): 985–994. doi:10.1113/jphysiol.2001.013067. PMC 2290093. PMID 11826181. ^ a b c d "Please update" (PDF). Archived from the original (PDF) on 2010-12-14. Retrieved 2015-01-07. ^ a b c d e Elias, P.M. (2007). "The skin barrier as an innate immune element". Seminars in Immunopathology. 29 (1): 3–14. doi:10.1007/s00281-007-0060-9. PMID 17621950. ^ Iizuka, Hajime (1994). "Epidermal turnover time". Journal of Dermatological Science. 8 (3): 215–217. doi:10.1016/0923-1811(94)90057-4. PMID 7865480. ^ Hennings, H; Kruszewski, FH; Yuspa, SH; Tucker, RW (1989). "Intracellular calcium alterations in response to increased external calcium in normal and neoplastic keratinocytes". Carcinogenesis. 10 (4): 777–80. doi:10.1093/carcin/10.4.777. PMID 2702726. ^ Pillai, S; Bikle, DD (1991). "Role of intracellular-free calcium in the cornified envelope formation of keratinocytes: Differences in the mode of action of extracellular calcium and 1,25 dihydroxyvitamin D3". Journal of Cellular Physiology. 146 (1): 94–100. doi:10.1002/jcp.1041460113. PMID 1990023. ^ Reiss, M; Lipsey, LR; Zhou, ZL (1991). "Extracellular calcium-dependent regulation of transmembrane calcium fluxes in murine keratinocytes". Journal of Cellular Physiology. 147 (2): 281–91. doi:10.1002/jcp.1041470213. PMID 1645742. ^ Mauro, TM; Pappone, PA; Isseroff, RR (1990). "Extracellular calcium affects the membrane currents of cultured human keratinocytes". Journal of Cellular Physiology. 143 (1): 13–20. doi:10.1002/jcp.1041430103. PMID 1690740. ^ Mauro, TM; Isseroff, RR; Lasarow, R; Pappone, PA (1993). "Ion channels are linked to differentiation in keratinocytes". The Journal of Membrane Biology. 132 (3): 201–9. doi:10.1007/BF00235738. PMID 7684087. ^ Tu, CL; Oda, Y; Bikle, DD (1999). "Effects of a calcium receptor activator on the cellular response to calcium in human keratinocytes". The Journal of Investigative Dermatology. 113 (3): 340–5. doi:10.1046/j.1523-1747.1999.00698.x. PMID 10469331. ^ a b c Gilbert, Scott F (2000). "The Epidermis and the Origin of Cutaneous Structures". Developmental Biology. Sinauer Associates. ISBN 978-0-87893-243-6. ^ Weschler, Charles J. (April 8, 2011). "Squalene and Cholesterol in Dust from Danish Homes and Daycare Centers". Environ. Sci. Technol. 45 (9): 3872–3879. Bibcode:2011EnST...45.3872W. doi:10.1021/es103894r. PMID 21476540. ^ Denda, M.; Tsuchiya, T.; Elias, P.M.; Feingold, K.R. (2000). "Stress alters cutaneous permeability barrier homeostasis". Am J Physiol Regul Integr Comp Physiol. 278 (2): R367–372. doi:10.1152/ajpregu.2000.278.2.R367. PMID 10666137. ^ Tsai, Jui-Chen; Guy, Richard H.; Thornfeldt, Carl R.; Gao, Wen Ni; Feingold, Kenneth R.; Elias, Peter M. (1996). "Metabolic Approaches To Enhance Transdermal Drug Delivery. 1. Effect of Lipid Synthesis Inhibitors". Journal of Pharmaceutical Sciences. 85 (6): 643–648. doi:10.1021/js950219p. PMID 8773963. ^ Blank, IH (1952). "Factors which influence the water content of the stratum corneum". The Journal of Investigative Dermatology. 18 (6): 433–40. doi:10.1038/jid.1952.52. PMID 14938659. ^ Downing, DT; Stewart, ME; Wertz, PW; Colton, SW; Abraham, W; Strauss, JS (1987). "Skin lipids: An update". The Journal of Investigative Dermatology. 88 (3 Suppl): 2s–6s. doi:10.1111/1523-1747.ep12468850. PMID 2950180. ^ Bonté, F; Saunois, A; Pinguet, P; Meybeck, A (1997). "Existence of a lipid gradient in the upper stratum corneum and its possible biological significance". Archives of Dermatological Research. 289 (2): 78–82. doi:10.1007/s004030050158. PMID 9049040. ^ Montagna, William; Prota, Giuseppe; Kenney, John A. (1993). Black skin: structure and function. Gulf Professional Publishing. p. 69. ISBN 978-0-12-505260-3.